Where should you run your app? This section deals with developing and deploying apps locally on EnerGyan. When people hear the word ‘app’, most think of a sophisticated iOS/Android application for phones. We are here to change that mindset. For us, an app is a piece of software than can perform a task(s). It can be something as simple as a Python script with few lines of code which sends you an alert when your energy consumption crosses a threshold. While this might seem simple (and it is), its a valuable feature to have when you’re battery is running low or your solar panel is not producing enough energy. When should you deploy your app on the computer? Your app is UI (user interface) based and needs a large monitor, keyboard etc. When should you run your app on EnerGyan? You should get necessary permissions and training before you proceed. They can also be accessed through SSH (wired or wireless). The boards are password protected. Talk to the admin/manufacturer for these details. Make sure the EnerGyan platform is up and running. The easiest way is to check the touch-display and see if it displays the default screen as shown below. For wired connection, connect EnerGyan to your router through an Ethernet cable. 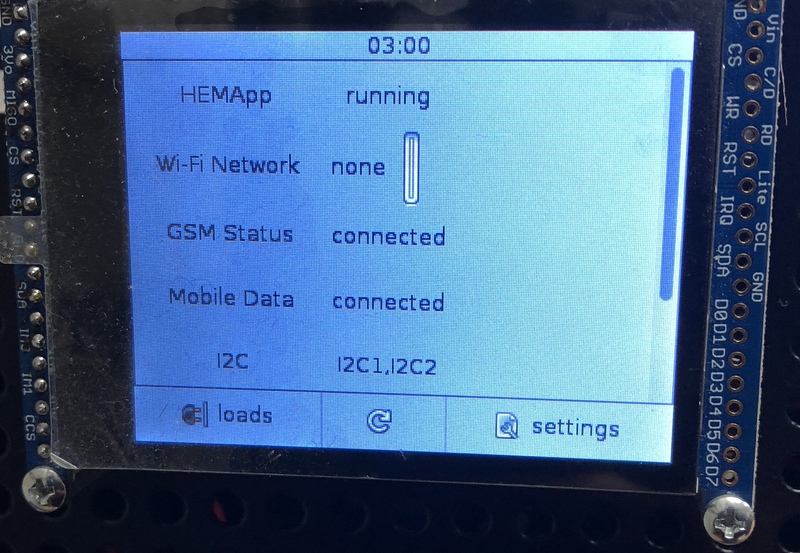 For wireless connection, use the touch display (on EnerGyan) to connect it to your WiFi. EnerGyan has an internal computer which runs a UDP server. This means your app (deployed on EnerGyan or on your computer) which acts as a UDP client can request data from this server and also send requests to turn on/off nodes. Here is a quick tutorial on UDP. Your app (which is the UDP client) can be written in any language. 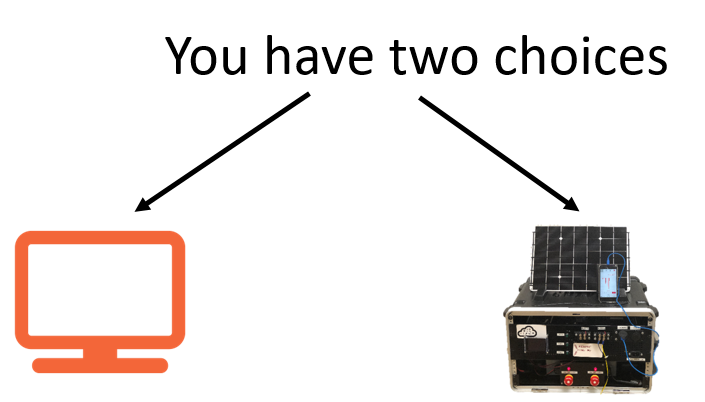 EnerGyan tool kit abstracts communication between UDP server and client so that you don’t have to worry about UDP communication. However, at this point the toolkit only supports Python. If your app is Python based, we got you covered. See Downloading the EnerGyan ToolKit. This toolkit abstracts all the communication between your app and the EnerGyan server. You can create a UDP client in JS using Node.js. See here for more details. Oracle has official Java documentation on UDP server and client. See this. You can also checkout this tutorial . Almost all popular computer languages have support for UDP. 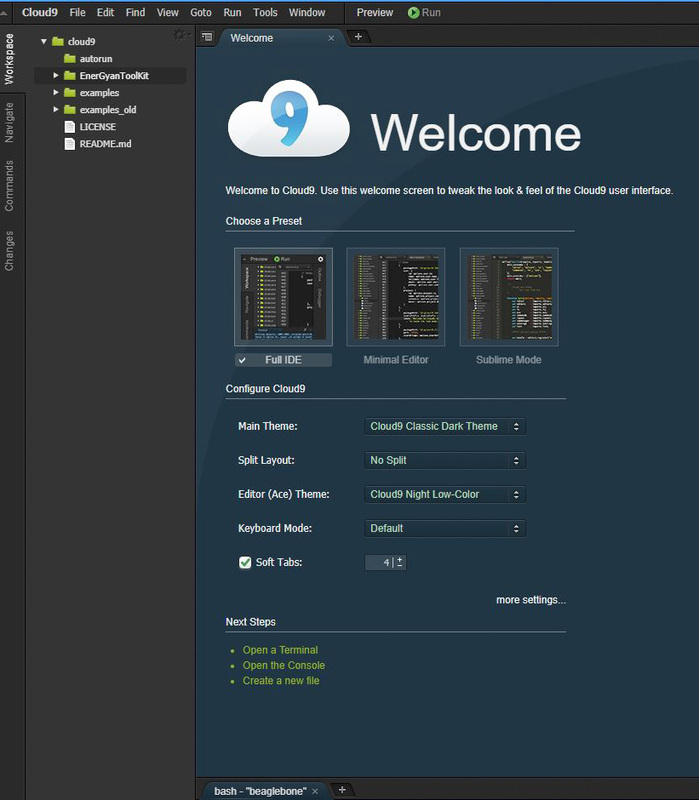 This opens up an online editor for developing and running your energy application. EnerGyan comes preloaded with the EnerGyanToolKit. On the online editor, select EnerGyanToolKit . 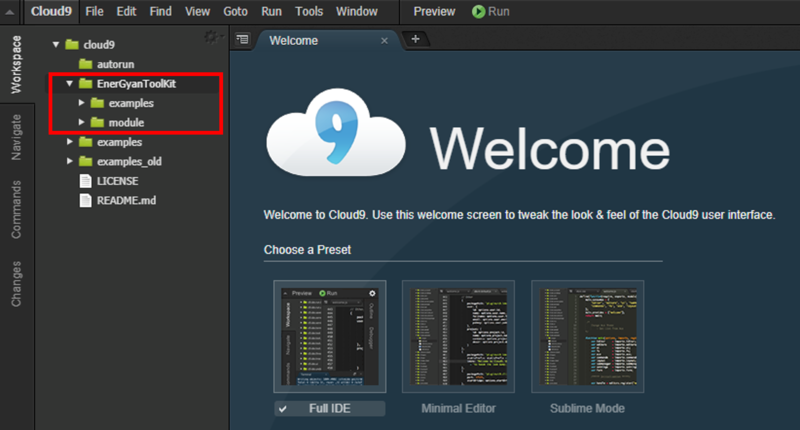 It has two sub-directories - module and examples. module - contains modules necessary to create and run an app. examples - contains sample apps. examples/bare.py is a skeleton app that you can build on. In the examples directory, select actuate.py. You should see the screen below. To stop your app, click on the Stop button located at the bottom of the editor. The picture below shows the output area of your app. The output of any print statements will be displayed here. To run the app on your computer, you need to download the EnerGyan Tool Kit. module - contains hem modules necessary to create an app. Copy this folder to your directory when creating your app. You can use bare.py as a starting point. It has all the boiler plate code you need for an energy app. If you’re running this app on your computer or a different EnerGyan (which is different from where you’re pulling the data), change the SERVER_NAME to the local ip address. If you find any bugs, you can create pull requests. sys.path.insert(1,'../') is used to define the path to indicate the location of the modules. Change this depending on your directory structure. This client is used to communicate with EnerGyan. The EnerGyan runs a server(called HEMApp server) to which you can send requests and receive responses This client abstracts the communication to make data communication between your app and the server easier. The argument to this function is the name of the trigger function. Whenever data is sent from the server, the trigger function gets called and it gives you two values message and address. This section is for EnerGyan DC. This section is for EnerGyan AC. Check out pullData.py to learn how to use it. VOLT:13.65 - VOLT is dc voltage and the value followed by : is the voltage in volts. Similarly, AMP, POW, ENERGY, CHARGE are for dc current, power, energy and charge respectively. NODE:0 - indicates the node number. This can go from 0-7 for dc systems and 0-5 for ac systems. DATE:12/8/17-2:28:40 - indicates the date and time. HEM Data Dump - HEM stores all the electrical data in a file data.csv in /media/card. This file is usually hundreds of megabytes. Copying the entire file for a small amount of specific data is unreasonable. 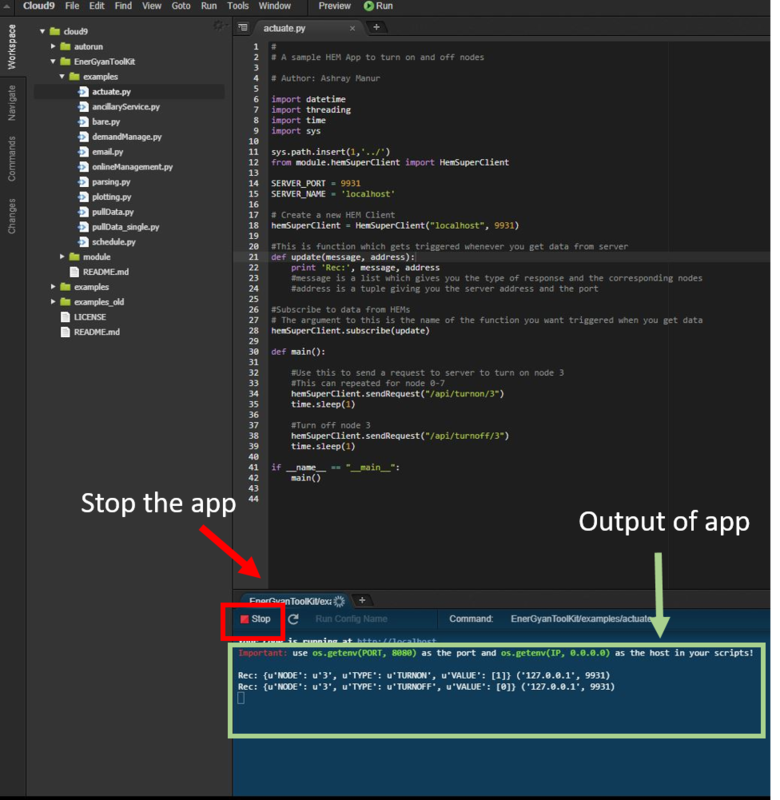 This tutorial shows how you can copy specific information from the data dump for your app. Three examples will be demonstrated. cmd = "grep -e '10/1/17' ../data/sample.csv > ../data/oneDay.csv"
cmd = "grep -e 'VOLT. *10/1/17' ../data/sample.csv > ../data/oneDayVolt.csv"
cmd = "grep -e '10/[1-8]/17' ../data/sample.csv > ../data/oneWeek.csv"
When you have other Internet devices that you’d like to connect to EnerGyan, you can use the following architecture. This can be useful for smart homes and sensor projects. Connect your sensors or other peripherals to a WiFi micro-controller (or add a WiFi module to an Arduino) through serial communication. You can also use single board computers (SBC) like Raspberry Pis and Your app on EnerGyan has two components. The first component is the UDP client which talks to the EnerGyan server. 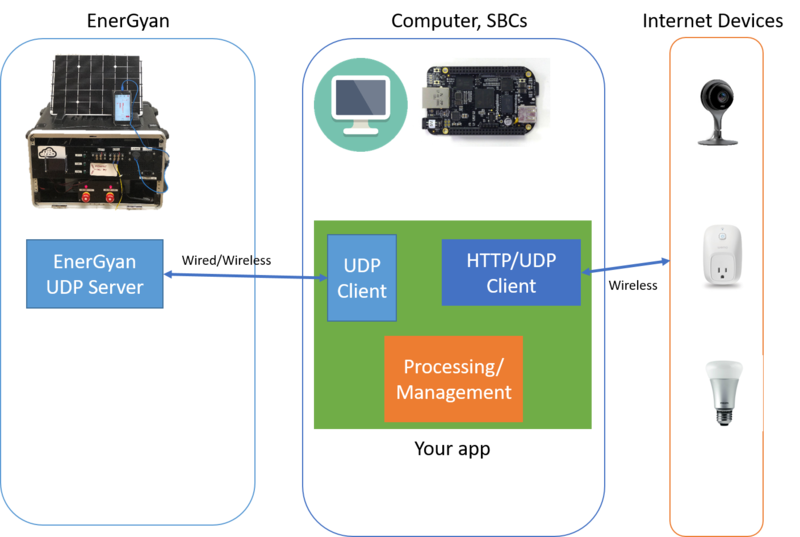 The second component is the HTTP/UDP server which communicates with the micro-controllers. You can add other components such as processing, management and intelligence units. When should I use this architecture? This is can be used when the post processing sensor data is lightweight. EnerGyan on-board computer is not suitable for running high-end image processing or graphics related apps. It works well for low-end sensor data and communication. When you have Internet devices that you would like to connect to EnerGyan through an intermediate device like your computer or powerful single board computers (SBCs). This configurations is when post processing of data from these Internet devices requires huge computing resources. Connect your Internet device (like NEST camera) to your network. Other devices on this network are EnerGyan and your computer. Your app runs on your computer. It has three components - UDP client, HTTP/UDP client and the processing unit. 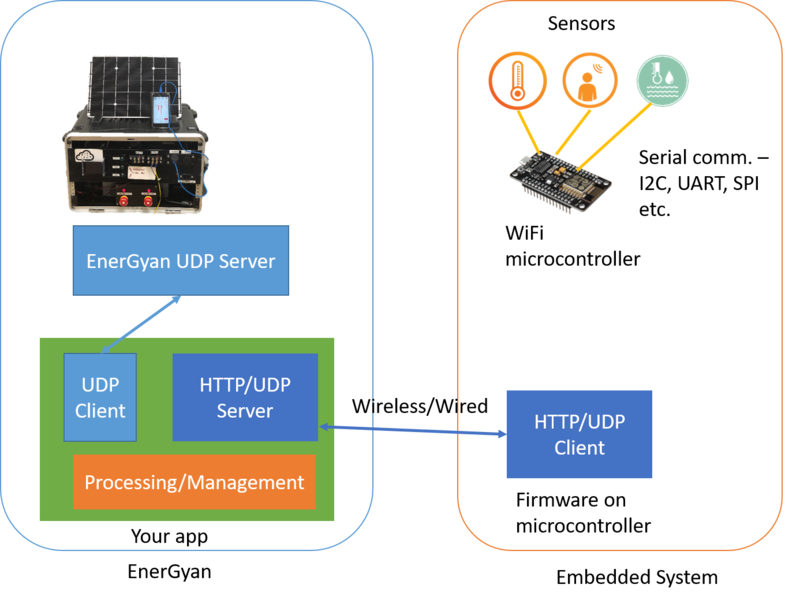 The UDP client communicates with the EnerGyan platform to send and receive data/actuate nodes etc. The second component of your app is the HTTP/UDP client which is pulling data from the Internet Device. When should I use this architecture? This is can be used when the post processing sensor data is intensive. For example, image processing is one example. © Copyright 2018, Ashray Manur Revision 796a83ef.